there have been reports that manatees have returned to the north coast in significant numbers and have recently been spotted by dive schools and fishermen just off the coast from sosua . This is very good news. Pods of Dolphins have also been spotted recently around Kite Beach. When we are kite boarding, we are also seeing more and more turtles in the water these days. are they sure it wasn't Rocky going for a swim??? great news and a great Foto, too. J.R.
would be nice to get a population of them back on the Isle. they are not always soft as a wild animal in it's family/group protecting their kids in the group, a human would be very unwelcome by then and should not underestimate the strength of such large animal. 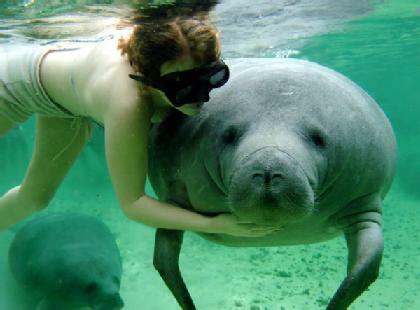 and i never found a Manati here. would be great to spot a family of 'em one day. Live and learn, I didn't realize they had left. My sister-in-law's brother purchased a hotel + restaurant on the north coast, I'm thinking it is Estero Hondo?? not far from Punta Rusia? We spent a day with him there. His boat says Manatee Bay or something similar. I was under the impression the manatees were still there! He's going to be offering boat rides to a private island [when I read Lambada's book I wondered if it was the same place she mentions] where visitors can spend the day, eat and swim etc.